German Shepherds are part and parcel of Western culture. They are movie stars, police and guard dogs, guide and family dogs. Remember Rin Tin Tin, rescue hero of note, who even has a star on the Hollywood Walk of Fame? There is a list of more than 80 TV shows and movies with German Shepherd actors. They are the number 1 choice for military and law enforcement. The American Kennel club ranks them second in popularity out of 193 breeds! Sadly, they are number 7 of the breeds most frequently found in rescue shelters. German Shepherd history all started with a yellow and gray sheepdog at a dog show in Germany in 1899. Bought by Max von Stephanitz for breeding, this dog is the grand ancestor of all purebred German Shepherds. It was the first ever registered German Shepherd. Its name, befitting a grandsire, was Horand von Grafrath. Max bred the German Shepherd Dog (GSD) to be a working dog and was ruthless about eliminating all negative characteristics. In later years breeding became far less controlled and there are opinions that it has led to inferior traits being allowed to develop in the GSD. Loyalty and bravery are synonymous with German Shepherds. But it is hard to be loyal to an owner who is never there. These dogs, despite their image as aloof and ferocious guard dogs, need companionship and must not be left alone for long periods of time. Working dogs need lots of physical exercise and mental stimulation. The last thing they need is to be chained – all you reap is frustration and aggression. High-quality commercial dog food appropriate to its age should be sufficient to keep your dog healthy. Sure, it’s a cute picture…but are eggs really safe for German Shepherds? We break it down in our complete guide to human food for dogs. Protein should be at least 22% and fat 5-8%. 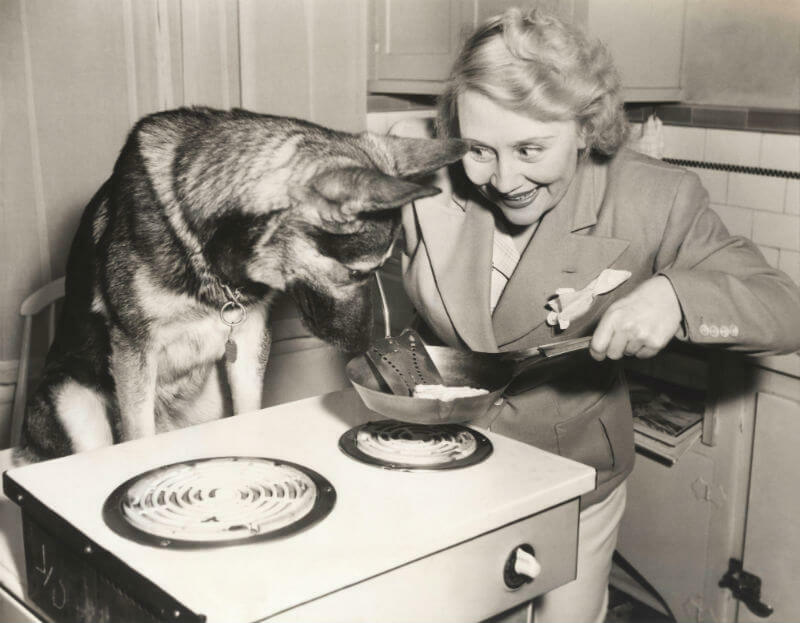 German Shepherds are prone to food guarding, so take the food away after 15 minutes of feeding. Grooming a German Shepherd is very basic and not a huge chore. Brushing every few days will keep the coat in good condition. Brush more often at shedding time, which is twice a year with the change in seasons. Long-haired German Shepherd Dogs need more frequent brushing. There are some brushing techniques that work better for the dog’s double coat. Don’t bathe too much, you remove the natural oils that keep the coat gleaming and soft. Clip nails when needed, and not too short. Ears and teeth need inspections to see that it remains clean. They were bred to work, so GSD’s need a lot of exercise. Walking twice a day is NOT a lot of exercise. In addition to walking it needs to run, jump, play, and wrestle. They will not do this if they are alone. Two dogs together in a big yard will keep each other busy, but they still need to get out with you and smell the daisies. Or the hawthorn bushes. Or anything else that’s interesting. Your German Shepherd must be trained to be sociable and to obey commands from puppyhood. Its innate instincts to guard and protect mean that they can act aggressive. This is fine when necessary but not so when it gets out of hand. Basic training results in a well-behaved and manageable GSD. As we know from their reputation, you can also train them for specific jobs. At all times the key to success is time, patience, commitment, and ethics. Healthy GSD’s are large, strong, and fast. Good food, enough water, lots of exercise and human interaction will go a long way to ensure your German Shepherd’s health. But there are a number of breed-specific health problems you need to be aware of. German Shepherd Dogs were bred to work and work hard. Their physical and psychological well-being is dependent on enough exercise and mental stimulation. If you do not provide that, she will become bored and frustrated. You will be stuck with a dog with a “behavioral problem” while in reality, it is you who do not understand the very biological needs of this breed. This does not mean you must train your dog to be a police dog or a guide dog. Work and challenging play will fulfill the same goal. Training German Shepherds is easy. Well, not really (because if it was easy, everyone would do it), but they are clever and want to learn. Training them to play specific games is fun for both the dog and for you. And you keep it “working” while it is actually playing. A full-grown male GSD can easily knock down a full-grown human male. This is just one of the reasons they are used by the police and the military. Think you can just throw your arm up and stand firm? This is important to remember if you have children or older people in your household. Training the dog to control its exuberance is vital if you want to avoid accidents. Males can weigh close to 90 pounds (40 kg), females more than 70 pounds (33 kg). Males can stand 26 inches (65 cm) at the shoulder, females 24 inches (60 cm). There are larger and heavier dogs of course, e.g. the English Mastiff. But how many of them come hurling at you when you least expect it? German Shepherds will protect its home and the family without being taught to do so. They can be very unwelcoming with your friends so here is where good training comes in. They must learn from you how to discriminate between strangers and friends. Otherwise, everyone who knocks at your door will be met with barking, growling, and possibly a bite. History abounds with evidence of GSDs who willingly put their life on the line for their owners. Some stories are absolutely heart-breaking and all of them attest to the astonishing loyalty of these dogs. These are the words with which the American Kennel club describes GSDs. And they are the experts, so you better believe it! German Shepherds are famous for their ability to learn and learn quickly. Backflips, yoga poses, balancing on human shoulders, all have been successfully taught to GSDs. In fact, one managed to learn 100 tricks by her first birthday. There are some ingenious toys on the market that will challenge your dog’s problem-solving abilities. And keep it amused if you have to stay inside for a longer time than usual. Teaching a German Shepherd to play these games is sometimes a learning experience for the owner as well! A cringing German Shepherd is a clanging alarm bell. It will do so only in extreme fear or pain. Even more so if it cringes and creeps before its owner. Something is terribly wrong. The phrase that should immediately spring to mind is animal cruelty. 5. Are They the Same as Alsatians? After World War I anything German was regarded with extreme distaste. The American Kennel Club decided to drop the “Geman” and called them shepherd dogs. The English called them Alsatian wolf dogs until 1977. The name Alsatian comes from the German French border area of Alsace-Lorraine. This name was in use in Europe for so long that some people still call them Alsatians. There is a newish dog breed in the USA called an “American Alsatian”. It is an Alaskan Malamute, German Shepherd, English Mastiff, Anatolian Shepherd, and Great Pyrenee cross. It is also called an Alsatian Shepalute. No, it is not recognized by any Kennel Club and there is some disagreement as to breeders’ claims that their dogs are “purebred”. Well, maybe not nothing at all, but a GSD drools and snores much less than many other breeds. If your dog starts drooling more than usual it is a sign of trouble. There could be something stuck in its mouth, or it may be ill. Better to have a vet check it out asap since it may be a sign of bloat, which is potentially fatal. Snoring is delightfully gentlemanlike. Or gentle-ladylike. If not, there is a variety of reasons why the dog may snore. A simple solution to excessive snoring often turns out to be a pillow. Yeah, yeah it seems ridiculous to give a dog his very own pillow on which to rest his weary head. But if his snoring keeps you from yours, a pillow is a small price to pay for peace! German Shepherds have a very acute sense of smell, even for a dog. Being a German Shepherd, it can do ground tracking as well as air scent. You will notice that your dog will sniff at anything and everything that is new or interesting. Including yourself! Do not discourage it, it is natural and provides the dog with important information about its environment and its family. There is a canine sport called AKC tracking where you can let your dog exercise its superior sense of smell and get recognition for it. Lots of fun for both you and the dog! The German Shepherds’ sense of smell is applied in serious jobs like drug busting, bomb squads, human remains recovery, medical diagnosis and identifying whether a person was present at a crime scene. 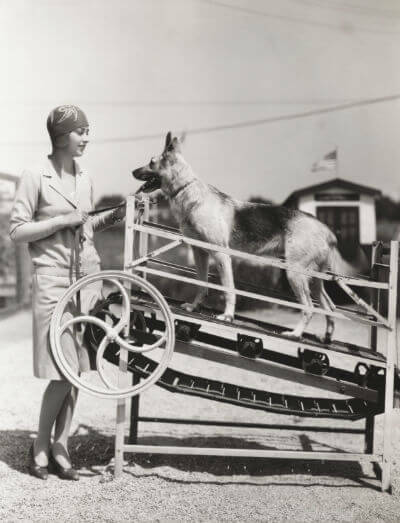 Dr. Gerhard Stalling was the first person to train German Shepherds as guide dogs for the blind. He opened the world’s first guide dog school in 1916 in Oldenburg, Germany. Several other schools followed all over Germany. 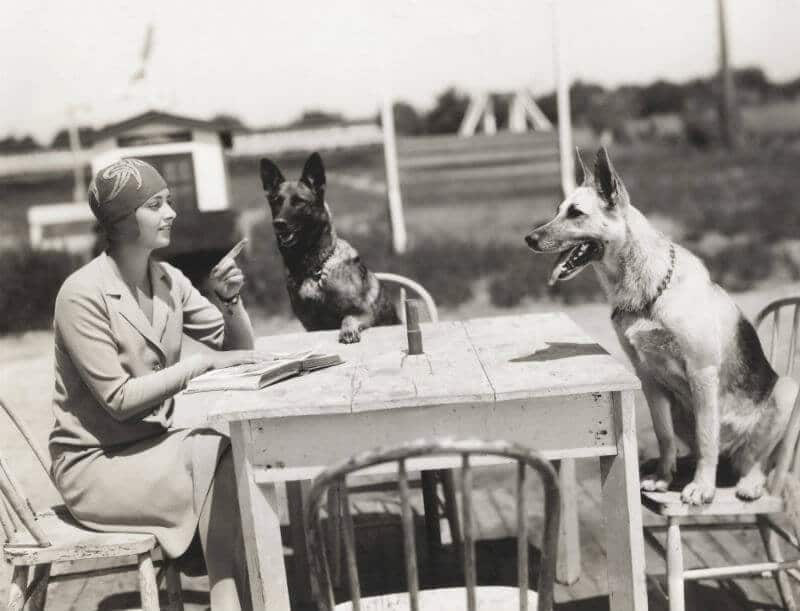 At the Potsdam school outside Berlin an American lady named Dorothy Harrison Eustis observed the guide dog training. She was so impressed that she wrote about in the Saturday Evening Post. This article and its consequences are famous. 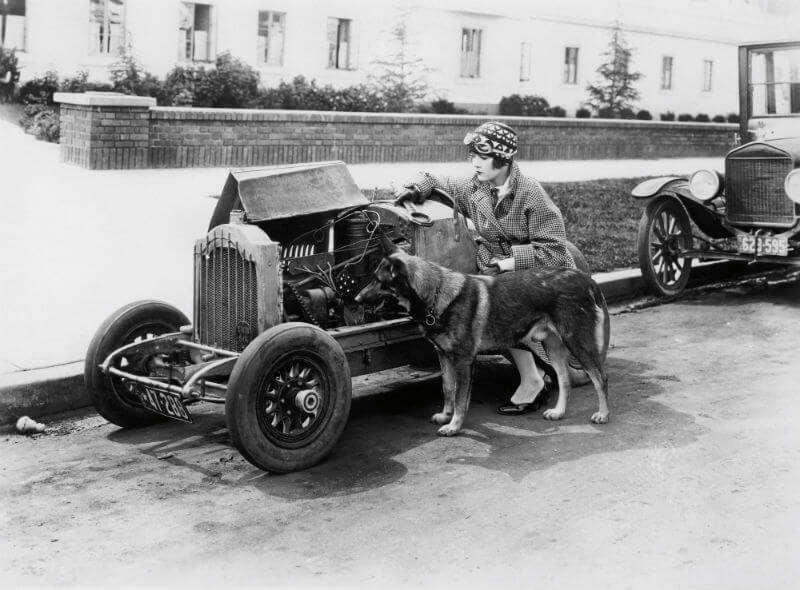 On June 11, 1928, having completed instruction by Dorothy in Switzerland, Morris Frank and his dog Buddy arrived in New York City. They proved that a blind person guided by a trained dog can safely operate in public by navigating a dangerous street crossing before throngs of news reporters. What followed was the creation of “The Seeing Eye”, a guide dog school for the blind in the USA. This school still exists and their dogs are the only ones who have the registered right to be called seeing eye dogs. Some dogs can age into their twenties. The German Shepherd Dog Club of America even has a special recognition for dogs 12 years and older called “The Thirteen (13) Club”. Curiously, large dogs have shorter lifespans than small dogs. Usually the opposite is true in mammals. The dog breed with the longest verified life expectancy is….drum roll…..the Chihuahua! Put that in your teacup! The most recognizable German Shepherd has a black saddle with tan, gold, or light grey markings. The undercoat is grey or fawn and the nose is always black. The Kennel Club in the UK also recognizes all black dogs and sable dogs. The American Kennel Club Breed Standard is much more tolerant. It says most colors are permissible except pale, washed-out colors, blues, livers, or whites. In fact if you worry about disqualification color is the last thing you should consider. The breed standard says unequivocally that disqualification will be visited upon: “Any dog that attempts to bite the judge.” Down, boy!!! One of the best characteristics of GSDs are their big, pointy, erect ears. It is the ultimate feature that emphasizes their alert and watchful nature. The face just comes alive when it watches and turns the ears forward the better to hear you with. Oh. Where have we heard that phrase before? Puppies have floppy ears that can go up, down, and back up a number of times between 4 weeks and 7 months of age. By 8 months the cartilage is hard and strong enough for the ears to stand up permanently. If at any time you have seen the ears of your puppy stand up they will be erect when he’s an adult. Flopping in-between will come to an end, so take those cute pictures while you can. It’s not classified in the Working group. Well, the name should give a clue why the German Shepherd is classified in the Herding Group. The Herding group of the AKC was created in 1983 and its members were formerly included in the Working Group (aha!). They include collies, sheepdogs, and corgis. The groupings are based on the characteristics and functions that the dogs were originally bred for. Working dog, herding dog, guide dog, pet. Whatever your German Shepherd is to you, it will give back love and care tenfold. 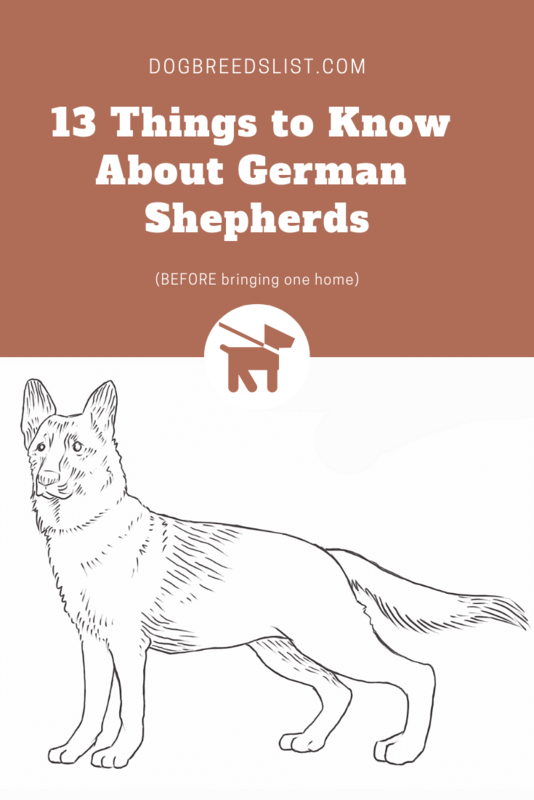 German Shepherd Origin: Where do German Shepherds Come From? Are German Shepherds Good Guard Dogs? 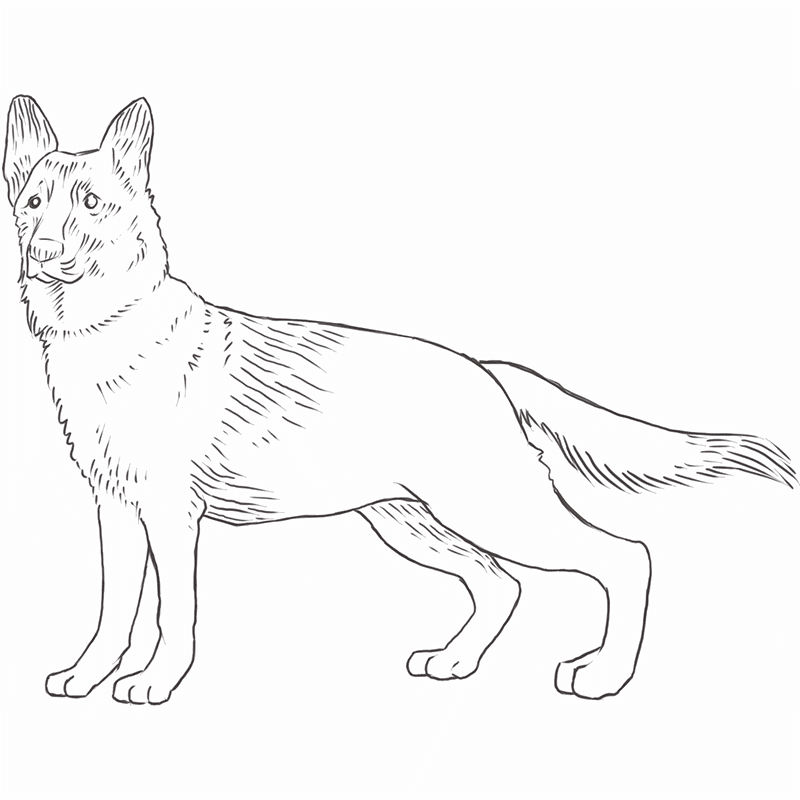 What is EPI in German Shepherds? Do German Shepherds Like Water? Swimming? Bath Time?